Only 3 ingredients for this chocolate crispy treat. These are my kids favorites. Make up a batch today and you will know why. Enjoy! I saw Ina Garten, The Barefoot Contessa make these on her show a few years ago. Then, that episode played again and that was the day I knew these had to be made in my home. I ran out to get a new box of corn flakes along with a good quality milk chocolate as well as bittersweet chocolate. We like Trader Joe’s chocolates and they have really great Belgian chocolate. My son Josh was with me and we grabbed the three ingredients and headed back home to make these gems. Oh yes, these are sweet, crispy gems indeed. The combo of the sweet milk chocolate and the intense bittersweet chocolate works so well together. Put that with crispy, crunchy corn flakes. Well, I don’t need to say anymore. You get the picture. Just a note… Ina put dried fruit in hers such as dried cranberries. I chose not to but, go ahead. It’s got to be yummy. Make these soon, you will be so happy you did! Line two large rimmed cookie sheets with parchment paper and set aside. Melt chocolate over a double boiler. Leave out about 1/8 to 1/4 cup of chocolate chunks. Make sure the water is not touching the bottom of the pan the chocolate is in. You can also melt the chocolate in the microwave at 25 second intervals. Stirring between each heating time. I like the double boiler way though. When the chocolate is melted, add the remaining chocolate in and stir, stir, stir until all the chocolate is melted, shiny and smooth. Place the cornflakes in a large bowl, pour the melted chocolate over the cornflakes and gently fold together with a rubber spatula. As soon as the cereal is coated. Drop big dollops onto the prepared cookie sheets. Let sit at room temperature until hardened. You can put them in the fridge for 15 minutes to speed it along. Note: Store in fridge up to 4 days in an airtight container. If the chocolate stays set on the counter and doesn’t get soft, they can be left on counter up to 2 days also in an airtight container. 1.Line two large rimmed cookie sheets with parchment paper and set aside. 2.Melt chocolate over a double boiler. Leave out about 1/8 to 1/4 cup of chocolate chunks. Make sure the water is not touching the bottom of the pan the chocolate is in. You can also melt the chocolate in the microwave at 25 second intervals. Stirring between each heating time. I like the double boiler way though. 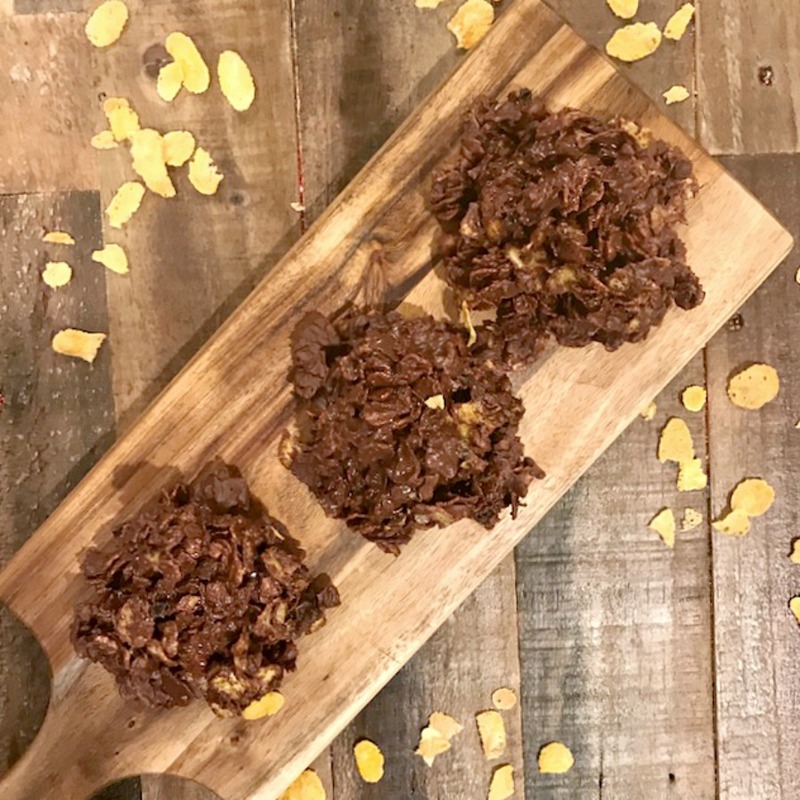 When the chocolate is melted, add the remaining chocolate in and stir, stir, stir until all the chocolate is melted, shiny and smooth.3.Place the cornflakes in a large bowl, pour the melted chocolate over the cornflakes and gently fold together with a rubber spatula. As soon as the cereal is coated. Drop big dollops onto the prepared cookie sheets. Let sit at room temperature until hardened. You can put them in the fridge for 15 minutes to speed it along. Enjoy these creamy, crispy treats!